EndGame PR is happy to announce the completion and launch of an all new website for the Virginia Association for Behavior Analysis (VABA). The organization’s mission is to promote and support the practice, research and dissemination of behavior analysis throughout the Commonwealth of Virginia. Until recently, however, its website was not up to snuff. 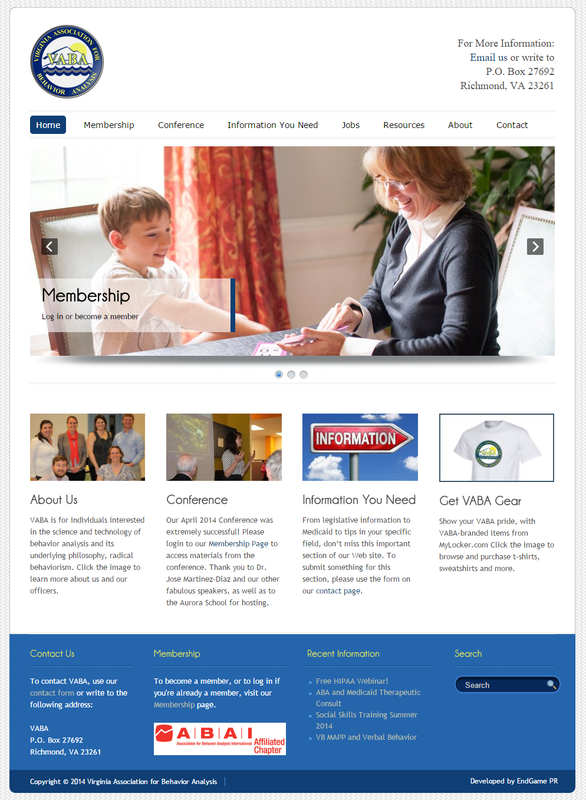 EndGame PR built a dynamic new home on the web for VABA, which includes a member’s only section, a membership management module, the ability to collect dues from members, a jobs page, a rotating banner on the front page, a news blog and a lot more. Click the image to the right to see a larger version of what the VABA front page looked like on launch day, and check out the full site here: Virginia Association for Behavior Analysis.